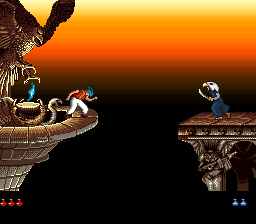 Prince of Persia 2: The Shadow and the Flame is a platform game originally released on PC (DOS) by Brøderbund in 1993. Unlike the first game (which has ported of a dozen other systems) this second game has only 3 ports: Macintosh (Released on 1994), SNES (Released on 1995), and a cancelled/unreleased Genesis version (This game is almost finished, except for one flaw/forgotten of Stage 9). The SNES port Prince of Persia 2 is generally regarded as a bad port of a very hard platforming puzzle game. The controls are clumsy, the puzzles are seemingly random, and the player dies very easily. The port also leaves out the last level. Fortunately there is a major bug in the game that allows large parts of it to be skipped. And this new TAS shows for the first time, new bugs exclusive of this SNES port! Aims for fastest time (Not in-game time, since clear time on final of each level no longer exists on this game). This run is 1:53.10 (6797 frames) faster (on Bizhawk, due of more accurate emulation) than Alyosha's published run, thanks for several new improvements, including much better gameplay optimization, some new bugs, skips on Stage 5, 6 and 7, ghost glitch activated on Stage 8 instead of Stage 9, and Shadow, Flame, & Jaffar, on Stage 13, no longer exists in this run. Some days before submitting my Prince of Persia SNES TAS, I remembered of a glitch (discovered 6 years ago) that works only on lava when rising. And activing this glitch, it's possible to skip most half of Stage 5! And during my research to finding new ways to activate this glitch without lava, accidentaly I discovered 2 big new shortcuts! One of Stage 6, and other of Stage 7. After this findings, I started this TAS. During this work, I found much more improvements on this game than when was working on Prince of Persia 1. Level 1 - After dodging the 4th guard, instead moving to left, I stopped movement and press up instead, saving 9 frames. Other frames is for better optimization. Level 2 - The last 2 frames optimized before of final of Level 1, changed a bit of RNG of these tiles of Stage 2. Because of this, Instead to get sun, I changed to skull, otherwise, several frames that gained on Level 1 will lost. A jumping is done on final tile due of a flaw on this SNES port, which sometimes this game doesn't detect correctly if you standing on that square. Level 3 - Notable optimizations, including on the exit room. Level 4 - Several notable optimizations. Instead to hold down before grabs the last ledge, I grabs first and right after this, pressing down to drop, gaining some pixels, saving 16-17 frames. 1 - This room is a checkpoint. 2 - In other rooms, cancelling this glitch leaves back to start of this level. WARNING: Do not exit the bridge room until has fallen completely, otherwise, some memory of this game will corrupt, causing a series of platforms 2 levels later to be impossible to catch onto. And you can't use this sword due of this bug. Level 6 - 3 frames is sacrified to manipulate and dodging the floating head. After some climbings, instead to go up, I climb on the wrong way and zips in a wall, skipping some paths, allowing to get a lower route instead of a normal route. Level 7 - Some better optimization and a same skip did on Level 6. ...Level 9 - As the bug has been activated on previous level, I go to the final directly, recovering most of time lost (+ the other time lost recovered on previous level, skipping a tunnel and a snake on Level 8). 139-160 frames gained for this new route! Level 10 - Some better optimization. Level 11 - Several new optimizations, better stopping movements, and 2 new routes: one to reduce lag, other, is climbing before the exit switch room (Climbs right instead of left). Note: After a better first climb, drawing the sword is faster, since prince gains enough pixels to did the third climb successifuly. Level 12 - Some better optimization. Drawing a sword, dying on the flame, and guarding the sword again. Due of not having flame, the fake prince (Jaffar), don't appear, allowing me to go on exit without wasting time with Jaffar! And the end input is 2-3 frames earlier than Alyosha and Nitsuja's previous TAS. Special Thanks to Alyosha and Nitsuja for his published runs. Well, I noticed that Prince of Persia Sega CD version, the gameplay is similar to the PC version, allowing the possibility of use some skips that I found in an old SprintGod's DOS speedrun. In addition, the Sega CD version, if you pause during the game, you can change the speed of the game and the battles of 3 to 1, making the game faster than any other port. I do not know if this kind of option is allowed on a type of this game on a TAS. Masterjun: The nice improvements and new skips make this a solid run. The previous movie was published into the Vault, but this game managed to get into Moons once before and with the short duration, new glitches and great viewer feedback, this run deserves an upgrade from the Vault. Accepting to Moons as an improvement to the previous run.